After reading Rick Johnson’s excellent article in compass points about a Martin 242 named “ZIP’, it brought back memories of another time, many moons ago, of another “ZIP” that sailed with AYC. 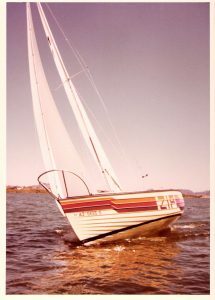 This “ZIP” was a Montgomery 17 flush deck, which was my first new boat, and pride and joy. Pale yellow, with multi colored stripes, 1200 lbs displacement, 25 ft. mast, no interior, shoal draft keel with centerboard, and a ball to sail. We raced her for 3 years with the club, and in San Carlos Mexico, with Tucson Sailing Club, which also had several M17 flush decks sailing in their club. Al Jr. was a crew down there with me at least once. We also put the mast in the water when a wind shift knocked us down while under spinnaker. Very exciting. I sailed with her for 3 years, until I decided I wanted a boat with accommodations below, and good light air capability. Thus did the San Juan 24, “Bigamy” come into my life, but that story will be for another time. Do YOU have a story about any of the many one (or two) of a kind boats that have sailed with AYC over the years? They have likely been in either the Portsmouth or PHRF fleets. Here are some photos of a few that may help you remember!. It would be nice if any of you have a special boat in mind, or just one you were fond of that you would write and mention in an article too! Send them to CompassPoints@ArizonaYachtClub.org . .org .